John won the 25th ‘International Mr Leather’ contest in Chicago in May 2003 (the only Briton ever to have won the title). He turned to stand-up comedy in 2010 and since then has performed gigs at comedy clubs and theatres across the UK from Falmouth to Edinburgh, as well as solo shows in Atlanta, Chicago, Cleveland, Denver and Melbourne. Paid weekend work includes The Stand Comedy Clubs, Manchester Comedy Store, Brighton Komedia, Soho Comedy, Amused Moose and Downstairs at the Kings Head. 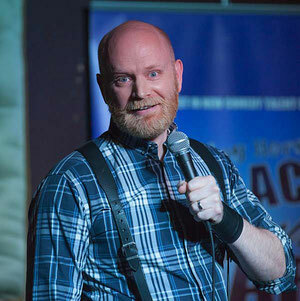 John has been a finalist in two national comedy competitions: Laughing Horse New Act of the Year 2015 and Old Comedian of the Year 2016.